This could easily be the best homemade chicken pizza recipe you’ll ever find. If you’ve never made a bbq chicken pizza you need to know that you can bake your pizza crust in the barbecue by putting it on low heat and leaving the crust in until the edges brown. Just put it on a Chef Caron nonstick BBQ grill mat. It will even leave grill marks on the bottom if you’re in to that. Barbecue pizza has become increasingly popular with the availability of pre-made pizz doughs and the bbq grill mat for cooking it on your grill. 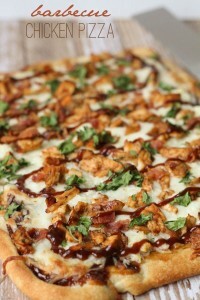 Let us know what you think of the BBQ chicken pizza after you try it. This is our absolute favorite bbq pizza especially when it’s made with the addition of jalapeño peppers If you try this barbecue pizza thing you can either use fresh jalapeños or the pickled ones, whichever you prefer. .
Homemade Pizza Dough or 1 13.8 oz can of pre-made Pizza Dough (you can use pre-made to make it more simple). I’ve listed some of my favorite pre-made pizza options below this post – you can get them on Amazon, of course. – 1 1/4 cups of your favorite BBQ sauce – Some great options are listed below this post. 1. Begin by cubing your chicken and tossing it 1/2 cup barbecue sauce. 2. Bake Pizza Dough for 5 minutes on your grill with the lid closed. Go for 350 degrees. 3. While Pizza Dough is still warm, distribute 1/2 cup pizza sauce over the entire surface of the pizza crust. (add more or less if desired). 4. Add cheese, barbecue chicken, cilantro and bacon to your pizza. Sprinkle with garlic salt. 5. Bake pizza on the grill mat for an additional 8-10 minutes or until cheese is melted and dough is golden brown. 6. Drizzle with more barbecue sauce, and ENJOY!